The good, the bad and the ugly. 30K is awesome, but like it or not, it's a derivative game of 40K. As such, changes to the 40K rule set can cause major changes to the 30K universe. 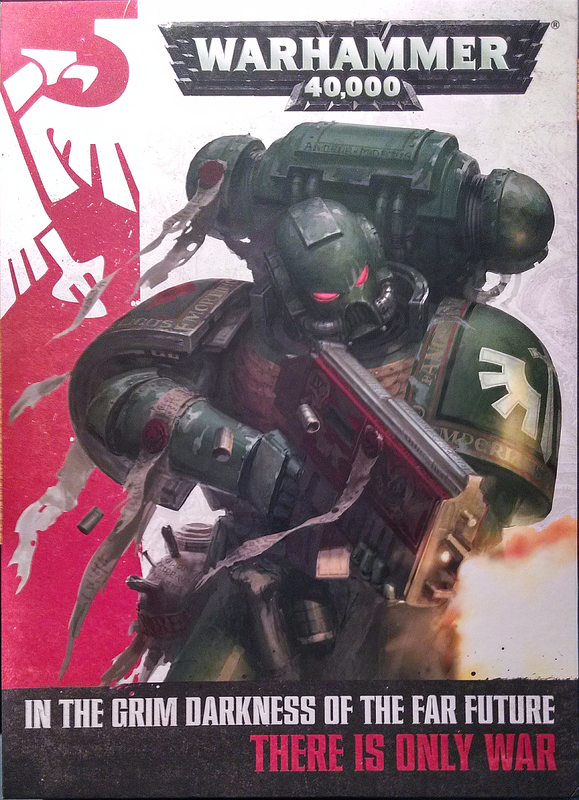 So let's take a look at the 40K rule changes in the most recent Official FAQ that impact 30K and in particular, the XIX legion. 1. Q: Using grenades in the Assault phase. Can every model replace their close combat attacks with a single grenade attack or just one model in the unit? Like in the Shooting phase e.g. a unit of 5 Tau Pathfinders charge a Knight. Do 5 Pathfinders make close combat haywire grenade attacks? A: Only one model from the unit can attack with a grenade in the Assault phase. Per Warhammer 40,000: The Rules, ‘Only one grenade (of any type) can be thrown by a unit per phase’. While hate this ruling with a passion, I accepting it. So let's talk about the ramifications. First off, Every infantry unit in the game just got worse at tank hunting and units with melta bombs just got NERFED HARD. It's especially a big deal for Legions that are rewarded for being infantry heavy but don't have any anti tank boosting rules. Raven guard would be one of these legions. So Recons, Vets, Assault Marines, Breachers and everything with a krak grenade should really consider a melta bomb Sgt or Powerfists as a SGT weapons. You may choose to deploy units that contain at least one model with this special rule last, after all other units (friend and foe) have been deployed. If both players have such units and choose to do so, the players roll-off and the winner decides who goes first, then alternate deploying these units. Units that Infiltrate in this way can be set up anywhere on the table that is more than 12" from any enemy unit, as long as no deployed enemy unit can draw line of sight to them. This includes in a building, as long as the building is more than 12" away from any enemy unit. Alternatively, they can be set up anywhere on the table more than 18" from any enemy unit, even in plain sight. If a unit with Infiltrate deploys inside a Dedicated Transport, the same rules apply when setting up their Transport. A unit that deploys using these rules cannot charge on the first turn. Having Infiltrate also confers the Outflank special rule to the unit of infiltrators that are kept in reserve. Honestly, nothing much changed here, but the language is clearer. 18" if they can see you 12" if they can't. 2. Q: Infiltrate rules state that an Independent Character without Infiltrate cannot join a squad of Infiltrators. Does this mean a squad that is actively Infiltrating or just any unit that has the Infiltrate rule? This matters for things like Outflank (granted freely by the Infiltrate rule) and Infiltrate units that have Deep Strike. A: An Independent Character without the Infiltrate special rule cannot join a unit of Infiltrators during deployment, whether they are Infiltrating, Deep Striking or Outflanking. They are free to join units as they wish after deployment. 2. Q: Are models with the Infiltrate special rule allowed to not use the rule to deploy and then charge normally in the first turn? 3. Q: Do Scout redeployment take place before or after the player going second is given the chance to Seize the Initiative? So this impacts Mor Deythan. You will be hugely committed in your rhino should you gget seized on. So remember to turn your rhino sideways, so you can hide behind it should it get blown up. Also dozer blades are helpful for scouting through cover, so if you get seized on, at least you have a cover save. 4. Q: Do weapon special rules that say 'a model equipped with this weapon' or 'this weapon's bearer' take effect even when NOT USED AS THE ATTACKING WEAPON? 5. Q: How do special rules like Hatred, Preferred Enemy and Monster Hunter work when targeting a mixed unit that contains models your special rule effects as well as models it doesn’t? A: The rules mentioned are used if any model in the target unit is of the appropriate type. Decapitation Strike just became A LOT better. Raven Guard can now hit retinues and deathstars VERY hard. It's also worth noting this happens in hth, every turn. It's also worth noting that this grants re roll To Hit & To Wound of 1's. So units like Vets with combi flamers are very close to hitting as hard as Mor Deythan when a IC is in a squad. 6. Gets Hot, Gets Hot and Re-rolls Replace the sentence with the following: ‘If a model has the ability to re-roll its rolls To Hit (including because of BS6+ or the Twin-linked special rule), a Wound is only suffered if the To Hit re-roll is a 1; it may also re-roll Gets Hot results of 1 for weapons that do not roll To Hit. This is great for seekers, plasma guns in decap strike and even plasma pistol Moritats. 7. Q: Does a flamer firing Overwatch have a maximum range? Seems like a fringe case until you start running rending flamer Vets. This happens a lot when they get charged. 8. Q: If a flyer which is forced to move 18" forwards due to an Immobilized result ends its move over an enemy unit, does it ‘Crash and Burn!’? A: No. Use the ‘Wobbly Model Syndrome’ rule, clearly indicating where the model’s actual position is on the table. 9. Q: Flyers can fire 4 weapons at full Ballistic Skill, can they also fire any additional weapons as Snap Shots like other vehicles? Interesting, as I was always under the impression you got 4 shots with fliers. Makes my fire raptors and lightnings much more dangerous. 10. Q: Can Super-heavy Flyers Jink? 11. Q: If a Hit & Run roll would take me off the table, do I stop at the table edge? Nice Clarification as it came up the other day in my angel's wrath list. More importantly, is that you can actually use the table edge to limit the range of your hit and run. 12. Q: When a model has Furious Charge as well as a power fist, does the 2x Strength modification happen before the +1 Strength modification? S9 power fists it is on Jumpers. 13. Q: Does the Preferred Enemy special rule allow you to re-roll Gets Hot rolls of 1 for blast weapons (e.g. a plasma cannon)? Not sure if there is a scenario for this one, but it would stack with decap strike. 14. Q: Does a unit that is embarked on a Transport that Jinks also count as having Jinked? This will affect us if we miraculously get whisper cutters! :) On a more serious note, this is a very big deal for 40k Raven guard if you use land speeder transports a lot. 15. Q: Are passengers in Jinking Transports forced to fire Snap Shots? 16. Q: Can a model with both Skyfire and Interceptor shoot at targets that are not Flyers with its full Ballistic Skill when they deploy from Reserve (e.g. Drop Pods)? Important rule clarification for mortus dreads and contempotors. You can not shut off Skyfire if you want to use interceptor. It's a big down grade clarification. 17. Q: Can you clear up exactly which rules stack and how when estimating cover saves? I’m thinking about Stealth, Shrouded, bonuses from cover, units, psychic powers, Venomthropes, Jink, etc. A: All of the above rules stack with each other (for example, a model with Stealth and Shrouded gains a +3 bonus to their cover saves). The same rule does not stack with itself though (for example, a model that has the Stealth special rule from two sources still only has a +1 modifier to their cover save, and a model that is Jinking and is in cover can only benefit from one of these cover saves). Thanks for making these posts and blog, I enjoy reading them even though I'm not Raven Guard player and this is very Raven Guard centric.